In my previous two articles, I showcased the first and second decades of Walt Disney World. As busy as the 1980s were, they were simply a prelude for the events that would roll forward in the 1990s, and to what Michael Eisner would call "The Disney Decade." More than just adding hotels and parks, Disney would change the paradigm of time shares, add a permanent circus, create fantastic new attractions to its current parks, build a new town, launch a brand new sports complex, create a virtual theme park and even enter the cruise line business. All this, plus the addition of more hotels and a brand new park. The face of the Walt Disney World Resort would change in a major way. Again, I've tried to use as many official, as well as unofficial resources as possible in gathering this chronology. Am I missing an event? Do I have a date wrong? Please share with us your knowledge so we can build the best time line possible. Moreover, help us celebrate this decade with your favorite memories of new attractions that came during this time. Summary: Walt Disney World kicks off a 20th Anniversary celebration in October marketing 20 new reasons to visit the resort based on attractions that had recently opened. Meanwhile the Persian Gulf War only lends itself to an uncertain economic time. April 20: Sci-Fi Dine-In Theater opens. 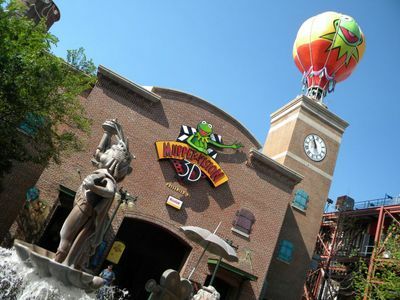 April 27: Jim Henson's Muppet Vision 3-D premieres at the Disney-MGM Studios. Jim Henson's Muppet Vision broke all the rules about 3-D. Photo by J. Jeff Kober. 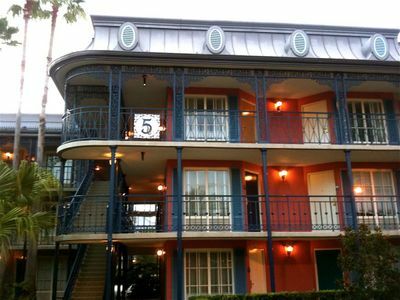 May 17: Disney's Port Orleans Resort opens the doors to its 1,008 rooms inspired by the New Orleans' French Quarter. All the quiet charm of New Orleans in this major resort addition. Photo by J. Jeff Kober. June 15: Studio Pizzeria, later to become Pizza Planet, opens at Disney-MGM Studios. September 14: Main Street Electrical Parade ends a 15-season run. September 16: Muppets on Location-The Days of Swine and Roses opens at the Disney-MGM Studios. September 22: Surprise Celebration premieres at the Magic Kingdom. September 26: Dinosaurs Live! premieres at Disney-MGM Studios. October 1: Spectromagic premieres at the Magic Kingdom. November 22: Beauty and the Beast stage show begins performances at the Disney-MGM Studios. Surprise in the Skies opens at EPCOT Center. Wee Links grows from six to nine holes and is renamed Disney's Oak Trail golf course. Pretty Woman premieres at Disney-MGM Studios. Team Disney building opens as the executive offices for the Walt Disney World Resort. Summary: Unemployment is high and the economy is in a slump. Walt Disney World fights back with its 20th Anniversary celebration. January: Voyage of the Little Mermaid premieres at the Disney-MGM Studios. January: Disney's Dixie Landings Resort becomes the newest moderately priced resort to open. 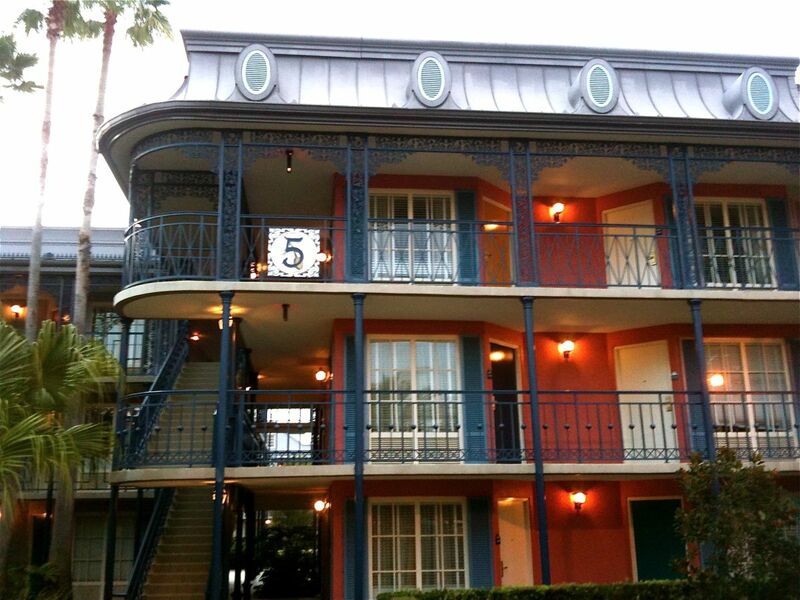 Disney's Dixie Landings offers more moderately priced choices, in a lovely, themed setting. Photo by J. Jeff Kober. January 23: Bonnet Creek Golf Club, featuring Osprey Ridge, designed by Tom Fazio and Eagle Pines, by Pete Dye, cements Disney's title as the "Magic Linkdom" with its 99 holes. April 12: The Euro Disney Resort opens in France. It will be renamed Disneyland Paris in 1994. 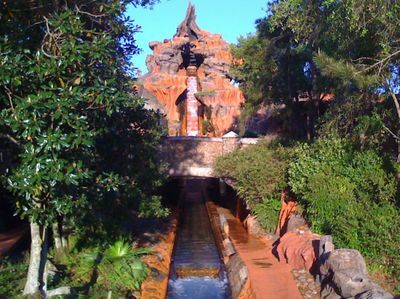 July 17: Splash Mountain opens. It will host a major media event in October. Splash Mountain provides a serious laughing place for thrill seekers. Photo by J. Jeff Kober. September: First official Disneyana Convention is held at Disney's Contemporary Resort for Disney memorabilia collectors. October: A homecoming celebration is held for Miss America Leanza Cornett at the Disney-MGM Studios. She formerly played one of the first Ariels in the Voyage of the Little Mermaid show. Christmas Holidays: Giant Macy's Thanksgiving parade balloons of Santa Goofy, Betty Boop, Kermit the Frog and Humpty Dumpty rise above New York Street at the Disney-MGM Studios. December: Disney Vacation Club opens with its first resort. It would later be renamed Disney's Old Key West Resort. A quiet moment at Disney's first vacation club, which would become Old Key West Resort. Photo by J. Jeff Kober. December 31: 8TRAX Club opens at Pleasure Island. Florida Disney Animation Studios announces the expansion of its studios, by doubling the number of animators. 2-3-4 Mickey Mouse, the company's prop-jet plane that flew Walt Disney and many Disney executives over the years, lands on World Drive and retires as a permanent fixture on the Backlot at Disney-MGM Studios. Brandon Adams, 10, of Baltimore, Md.,becomes the 400 millionth guest to enter a Disney theme park. A new 4,000-square-foot greenhouse opens in The Land, featuring integrated pest management systems. Aladdin's Royal Caravan rolls down Hollywood Boulevard. Mickey Forest, a reforestation of 50,000 trees and covering 2,000 acres in Lake and Orange counties, began to be visible from the air as a familar shape of Mickey Mouse. Academy of Television Arts and Sciences installs a Hall of Fame Plaza that inducts and honors Bill Cosby, Andy Griffith, Ted Koppel, Dinah Shore, Ted Turner and Sheldon Leonard. Summary: Things are happening, especially in Tomorrowland where a major transformation is occurring. Still, other efforts, like Barbie and Splashtacular at EPCOT Center, still seem to be out of step with where Disney is wanting to go. January: A new Energy Services headquarters building for the Reedy Creek Improvement district opens behind EPCOT Center's World Showcase and across the street near Disney's Caribbean Beach Resort. April 23: In an unprecedented "Swamp Swap," the Walt Disney World Resort purchases 8,500 acres in the Disney Wildnerness Preserve in Poinciana. The arrangement, to be managed by the Nature Conservancy, will allow Disney to utilize areas on property that were not permitted to be used because of their sensitive environmental impact. May 28: Groundbreaking is held for the Hollywood Tower Hotel. September: The Broadway at the Top show in the Top of the World at Disney's Contemporary Resort closes. October 1: Backstage Magic show in EPCOT Computer Control closes at EPCOT Center. October 4: Mission to Mars attraction closes. November 8: The Carousel of Progress spins again, refurbished with "A Great Big, Beautiful Tomorrow." November 15: Garden Grill Restaurant opens in The Land at EPCOT Center. November 18: The Hall of Presidents reopens with a new show starring President Bill Clinton as the first president in office to have an Audio-Animatronics figure with a speaking role. November 18-21: Walt Disney World brings 6,500 disadvantaged children from around the world to Mickey's Worldwide Kids Party. December 1: Magic Journeys ends its run at the Fantasyland Theater. December: EPCOT Center introduces "Splashtacular" and "The Magical World of Barbie." These short-lived shows expand the fountain display in Future World, as well as creating a permanent roof over the America Gardens Theater. The Sword in the Stone show opens in Fantasyland. Studio Showcase debuts 65 stop-motion puppets and 20 miniature sets from Tim Burton's The Nightmare Before Christmas. The American Adventure is restaged with a new ending. Summary: Now things are really cranking! New hotels, new attractions, and a major expansion of The Disney-MGM Studios. There's no slowing for the next several years. The Hollywood Tower Hotel sits as a backdrop to the bygone world of Sunset Boulevard. Photo by J. Jeff Kober. January 1: The name EPCOT Center is changed to Epcot '94. January 9: American Journeys closes in Tomorrowland. January 16: The inaugural run of the Walt Disney World Marathon is held through all three Disney theme parks and past many of the Disney resort hotels. With 12,000 runners participating, Leonid Shetsov of Russia and Judit Nagi of Hungary are the first winners. April 29-June 5: The first annual Epcot International Flower and Garden Festival is held. April 3: Frank Wells, president and COO of the Walt Disney Company, is killed in a helicopter crash. Jeffrey Katzenberg will resign shortly thereafter. April 29: Phase One of Disney's All-Star Sports Resort opens with the Surf's Up section. A new building will open each month until the grand opening celebration in September. May: The Land pavilion at Epcot reopens with a new look and updated attractions: Living with the Land and Food Rocks. 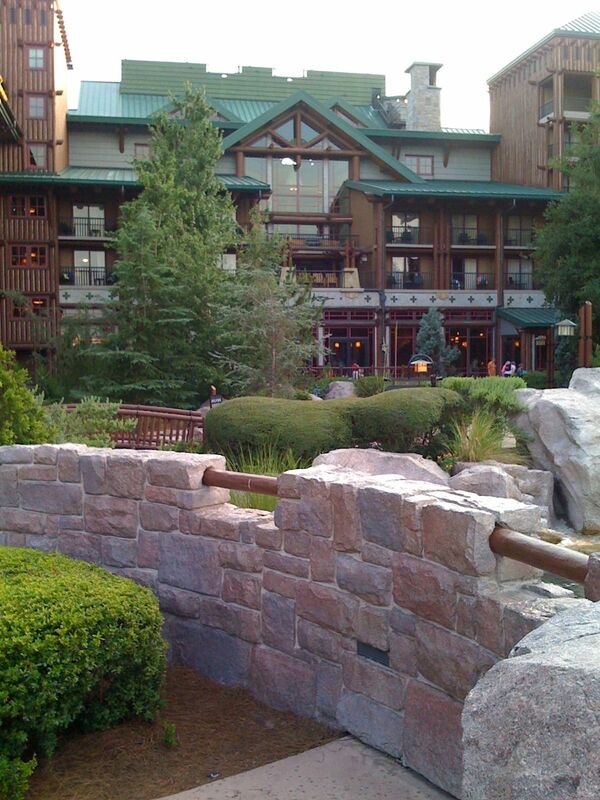 Immense theming and detail found at Disney's Wilderness Lodge. Photo by J. Jeff Kober. June 1: Mickey Mania Parade cranks the music down Main Street at the Magic Kingdom. July 8: The success of The Lion King spawns the Legend of the Lion King puppet show on stage at the Magic Kingdom. June 12: Sunset Boulevard opens with the 1,500-seat Theater of the Stars hosting the popular Beauty and the Beast—Live on Stage at Disney-MGM Studios. July 22: The Twilight Zone Tower of Terror attraction opens at the end of Sunset Boulevard. July: The WDI virtual reality lab opens with tests of Aladdin's Magic Carpet. August 28: Art of Disney shop opens in the Disney Village Marketplace. September 5: 20,000 Leagues Under the Sea closes in Fantasyland, though ships would remain in the lagoon much longer. September: Disney's Polynesian Resort opens a three-story concierge building. October: Innoventions officially opens with the help of Bill Nye, The Science Guy. A wide array of attractions are on display, but the hit will be the Sega games for youngsters. November 21: Honey, I Shrunk the Audience 3-D film opens. November 21: The Timekeeper opens in Tomorrowland. Holidays: The Candlelight Processional moves from the Magic Kingdom to premiere at the America Gardens Theater in Epcot. December 9: Cosmic Ray's Starlight Cafe opens in the place of the Tomorrowland Terrace. December 17: Snow White's Scary Adventures reopens in the Magic Kingdom with Snow White appearing in various scenes for the first time. 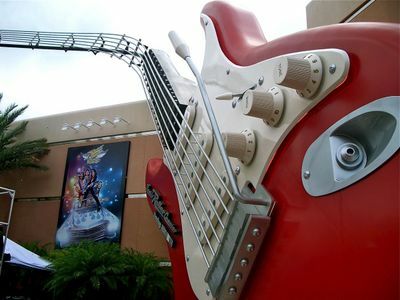 December 17: Planet Hollywood opens at Disney Village with Sylvester Stallone, Demi Moore, Bruce Willis, Arnold Schwarzenegger, and dozens of stars. Summary: Even if they can't figure out the title of Epcot, things are happening in a big way. The highlight of the year will be the amazing new Blizzard Beach Water Park. Epcot '94 is now Epcot '95. January 21: Circle of Life replaces Symbiosis at The Land's Harvest Theater. February: Destination Disney, a visitor center, opens at the Cincinnati/Northern Kentucky International Airport. April 1: Blizzard Beach opens as Disney's third water park. April 12: The 'Ohana restaurant opens at Disney's Polynesian Resort. May 15: The California Grill opens up on the top floor of Disney's Contemporary Resort. It will usher in a new era of dining at the Walt Disney World Resort. 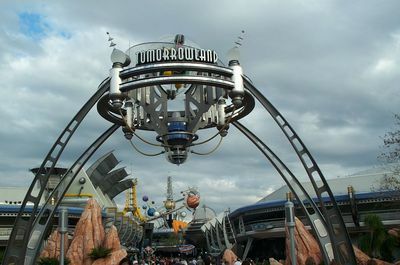 June: A new Tomorrowland is dedicated, featuring the ExtraTERRORestrial Alien Encounter, the Astro Orbiter, and a new pre-show for Space Mountain, in addition to The Timekeeper and Carousel of Progress which had already reopened. A new Tomorrowland captures the imagination of guests. Photo by J. Jeff Kober. July 15: Disney's Fairy Tale Wedding Pavilion opens. October 1: Disney opens its first Vacation Club Resort outside of Walt Disney World at Vero Beach. November 22: Toy Story Parade premieres at the Disney-MGM Studios. Ace Ventura on Location also opens on the New York Street Set. Christmas: The Osborne Family Spectacle of Lights premieres on the backlot of Disney-MGM Studios. Living Seas at Epcot '95 inaugurates the Dolphin Exploration and Education Program (DEEP) and DiveQuest, as well as overnight adventures for school age children. Spaceship Earth reopens with a new narration by Jeremy Irons. AT&T Global Neighborhood also opens. Plans are unveiled for a fourth major Walt Disney World theme park, Disney's Wild Animal Kingdom. Walt Disney Chairman Michael Eisner also announces an expansion of the Disney Village shopping, dining, nightclub area, to be renamed as Downtown Disney. Howard Johnson Resort Hotel and the Guest Quarter Suites Hotel in Walt Disney World Hotel Plaza change names to Courtyard by Marriott and Doubletree Guest Suites Resort, respectively. The Spirit of Pocahontas opens at the Back Lot Theater at Disney-MGM Studios. The Twilight Zone Tower of Terror changes the ending with three 13-story drops. Over the years it would continue varying the drop sequence. Summary: Walt Disney World is cranking away. Hotels, attractions, institutes, and even miniature golf. And curiously, there's a new city sprouting up in the form of Celebration. It all culminates with the 25th anniversary of Walt Disney World. This will be a year to remember! 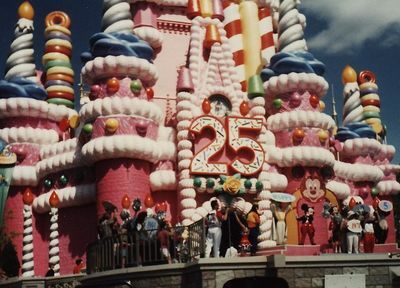 The never-to-be-forgotten colors of a Pepto Bismol-colored castle. Photo by J. Jeff Kober. January 27: Inaugural Indy 200 is held on a new Walt Disney World Speedway tri-oval track adjacent to the Magic Kingdom parking lot. January: Disney Vacation Club Resort changes it's name to Disney's Old Key West Resort to distinguish it from other up and coming club resort locations. February 1: The Disney Inn reopens as Shades of Green. February 9: The Disney Institute opens as a sort of Chautauqua for cooking, gardening and other hobby-like programs. Within a year it will be changed out to being the home for Disney University Professional Development Programs which had been going on since the 1980s. 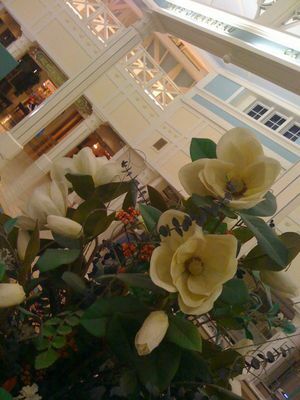 February 13: The GM Preview Center opens in Future World at Epcot. Delays with the technology of the cars delays Test Track for an uncertain period to come. February: American Film Institute (AFI) Showcase opens at Disney-MGM Studios, celebrating 100 years of American Filmmaking. 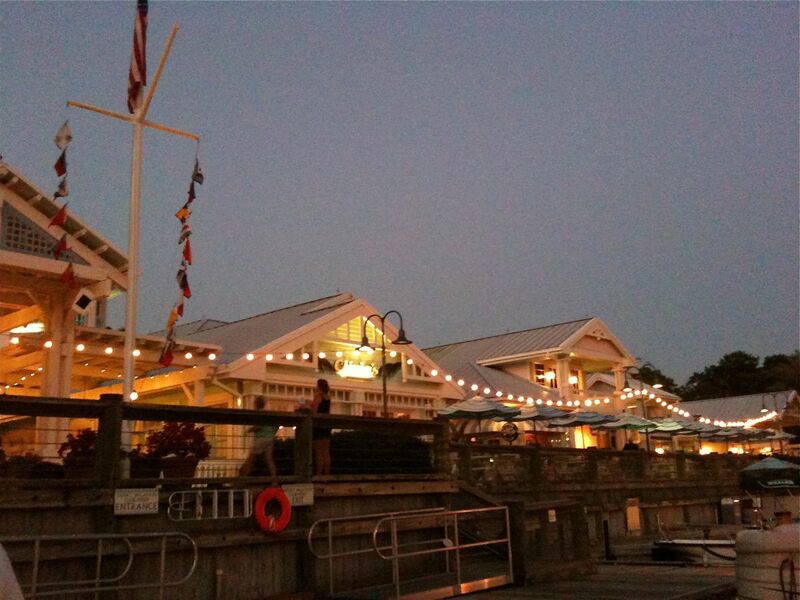 March 1: Disney opens Hilton Head Island Resort as a new Disney Vacation Club property. 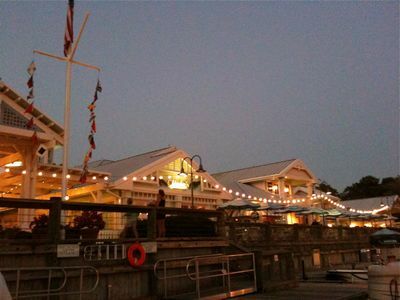 March: Fulton's Crab House opens in place of the former Empress Lilly Riverboat. May: Fantasia Gardens Miniature Golf opens near the Swan and Dolphin hotels. June: Disney's Hunchback of Notre Dame—A Musical Adventure opens on the backlot stage at the Disney-MGM Studios. July: Disney's Boardwalk complex opens with an Inn, Villas, and an entertainment center. An array of entertainment and dining options await guests now at Disney's Boardwalk. Photo by J. Jeff Kober. Summer: Rainforest Cafe opens in place of Chef Mickey's at what is now Downtown Disney. Summer: The first residents move into Celebration. September 15: The Universe of Energy is re-imagined with narration by Ellen DeGeneres and Bill Nye, the Science Guy. October 1: First Lady Hillary Rodham Clinton, Roy E. Disney and Michael Eisner kick off a 16-month-long 25th Anniversary Celebration for Walt Disney World. Inaugural festivities include a 2,000-member marching band in front of a giant pink Cinderella Castle transformed as a birthday cake. The new 25th Anniversary parade begins, as well. October 1: Mickey's Toontown Fair replaces Mickey's Starland by opening a new Mickey Mouse meet 'n greet area, a new character meet 'n greet area and retail operation, a new playground, a new Donald Duck boat, a new home for Minnie Mouse, and Goofy's Barnstomer roller coaster. Donald Duck docks at the new Mickey's Toontown Fair. Photo by J. Jeff Kober. October 1: New 25th Anniversary Welcome Center opens in Magic Kingdom's Town Square. October 1: "IllumiNations 25" premieres at Epcot. October: The Grand Floridian Spa opens on property. October: World of Disney super store becomes the world's largest Disney character merchandise store, and a new anchor for the Downtown Disney Marketplace. October: ABC Super Soap Weekend premieres for the first time at Disney-MGM Studios. November: The Town Center for Celebration opens. Fall: The Walt Disney World/Oldsmobile Golf Classic is won by a young Tiger Woods, who had only just gone pro in August. Disney Cruise Lines announces that its first ship, the Disney Magic, will sail in 1998. Backstage Pass to 101 Dalmations premieres at the Disney-MGM Studios. Summary: The momentum keeps going, especially as Disney's fourth theme park is under construction and preparing for opening in the following year. Meanwhile, Disney's Coronado Springs Resort opens. March 1: The No. 5 locomotive, the Ward Kimball, begins operation at the Magic Kingdom. March: Disney's Wide World of Sports opens a 200-acre complex for athletics, including a 7,500 seat stadium for the Atlanta Braves spring training events. Sunset at Disney's Wide World of Sports. Photo by J. Jeff Kober. March: The first Star Wars Weekends event is held in connection with the 20th anniversary of Star Wars. April: King Stefan's Banquet Hall restaurant re-opens under the name of Cinderella's Royal Table. June: Hercules Zero to Hero Parade steps off at the Disney-MGM Studios. July: AMC Theaters opens with 24 separate motion picture theaters at Downtown Disney Pleasure Island. July: ABC Sound Studio opens at Disney-MGM Studios, where guests create a variety of FX to the theme of ABC-TV children's programming. August 1: Disney's Coronado Springs Resort opens not only as a moderately priced hotel, but as a major convention center. Disney's Coronado Springs Resort filled a major niche in creating hotel and convention space at a moderate price. Photo by J. Jeff Kober. August: Celebration's school opens for its first year of students. September: Goosebumps HorrorLand Fright Show opens at Disney-MGM Studios. it is based on R.L. Stine's popular tween books. September: Downtown Disney West Side opens with House of Blues, Bongos Cuban Cafe, Wolfgang Puck Cafe, Virgin Megastore, and numerous boutique stores. November: Celebration Health, operated by Florida Hospital, opens its doors. Mike Fink Keel Boats closes in Frontierland at Disney's Magic Kingdom after previously being moved from Liberty Square. Richard Petty Driving Experience makes its debut at Walt Disney World Resort. Flagler's restaurant is replaced by Citricos. 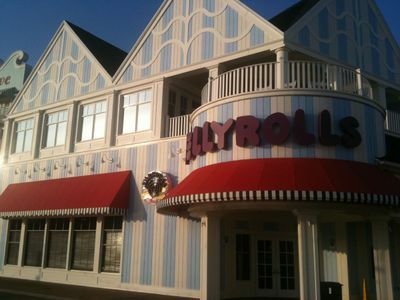 Spoodles restaurant opens at the Boardwalk Resort. Wolfgang Puck opens at Downtown Disney Marketplace. Summary: 1971 was huge because of Walt Disney World opening its doors. 1982 was big because of Epcot's huge undertaking. And 1989 was enormous due to the opening of the Disney-MGM Studios, Pleasure Island, and Typhoon Lagoon. But this year might rank even bigger, in that not only was Disney's Animal Kingdom the largest park in terms of physical size, but DisneyQuest, Cirque du Soleil and the Disney Cruise Line all began operations in this same year. Plus, there were resort additions and the introduction of new animation facilities and Fantasmic! at Disney-MGM Studios. This was an enormous year, noted quietly as the 75th anniversary of the Walt Disney Company. 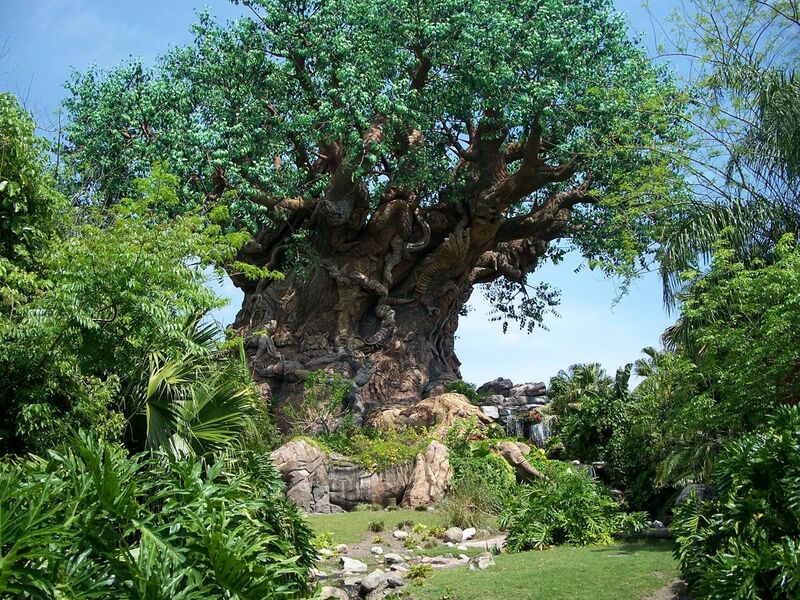 The Tree of Life serves as the centerpiece of Disney's Animal Kingdom. Photo by J. Jeff Kober. 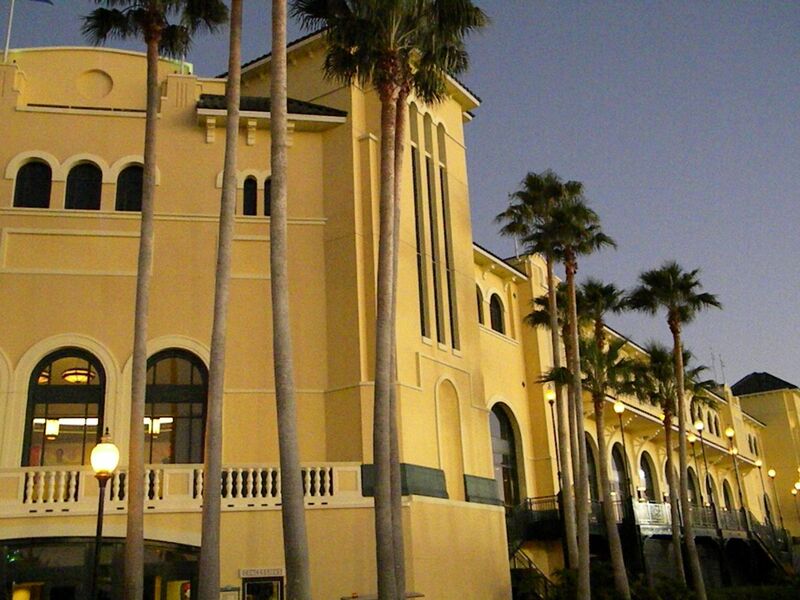 February: Official All-Star Cafe opens at Disney's Wide World of Sports. March: Cabins open at Fort Wilderness Resort, offering permanent accommodations. April: The Enchanted Tiki Room—Under New Management opens in Adventureland. April: The new Walt Disney Feature Animation building opens at the Disney-MGM Studios. It includes a parking garage. 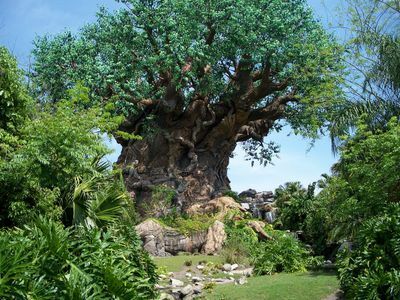 April 22: Disney's Animal Kingdom opens on Earth Day as Walt Disney World's fourth major theme park. 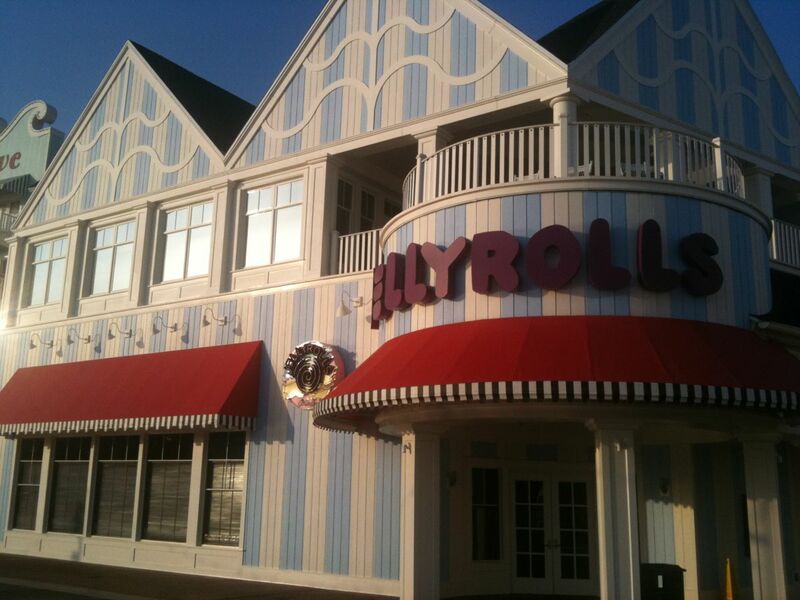 May and June: Wildhorse Saloon, and BET SoundStage Club open at Pleasure Island. June: DisneyQuest offers a virtual amusement park at Downtown Disney West Side. 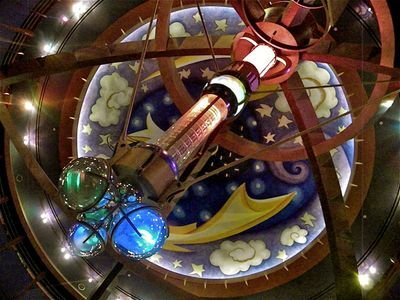 DisneyQuest opens as a virtual wonderland of attractions. Photo by J. Jeff Kober. June 19: Mulan parade premieres at the Disney-MGM Studios. July 30: Disney Cruise Line launches its first ship, the Disney Magic. Also unveiled is Castaway Cay, Disney's own private island. September 8: Mr. Toad's Wild Ride closes as a Fantasyland attraction. October: Buzz Lightyear's Space Ranger Spin opens in Tomorrowland at the Magic Kingdom. October 16: The Walt Disney Company is 75 years old. December 23: Cirque du Soleil opens in Downtown Disney West Side with La Nouba. Kona Cafe restaurant opens at Disney's Polynesian Resort. Main Street Cinema is transformed as a movie-themed retail space. Summary: The Disney Decade is still very busy. Moreover, it's getting ready to open on a major millennium celebration. Meanwhile, down the street, Universal Studios Florida becomes a resort with new hotels, an entertainment district, and a big new park named Islands of Adventure. Universal proves it can compete with immensely themed environments and attractions in the new Islands of Adventure. Photo by J. Jeff Kober. January 10: Horizons in Future World officially closes. 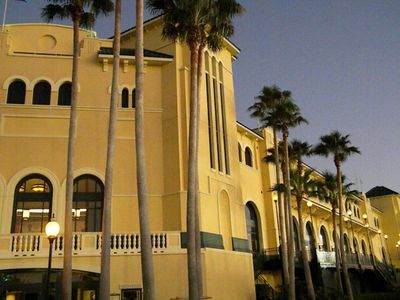 January 15: All-Star Movies Resort opens with 758 rooms. March 18: Kali River Rapids becomes the centerpiece of Disney's Animal Kingdom's first major addition: Asia. March: Winter Summerland miniature golf opens adjacent to Disney's Blizzard Beach. March: Disney's Doug Live! 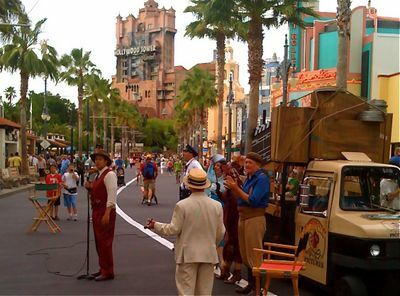 stage show replaces SuperStar Television at the Disney-MGM Studios. March: Test Track has its official grand opening at Epcot. April: Sounds Dangerous: Starring Drew Carey opens at the Disney-MGM Studios. April: Discovery Island is officially closed. May: The Main Street Electrical Parade returns to the Magic Kingdom having ended its run at Disneyland. June: The Many Adventures of Winnie the Pooh opens in Fantasyland. June: Bear in the Big Blue House stage show premieres at the Disney-MGM Studios on Soundstage 5. June: Michael Flatley's Lord of the Dance begins a 16-week run. It will return for another run the year after. July: Fairy Tale Garden opens in Fantasyland with daily retellings of Beauty and the Beast with Belle. July 29: Rock 'n' Roller Coaster Starring Aerosmith opens at the Disney-MGM Studios, culminating it's major expansion for the decade. 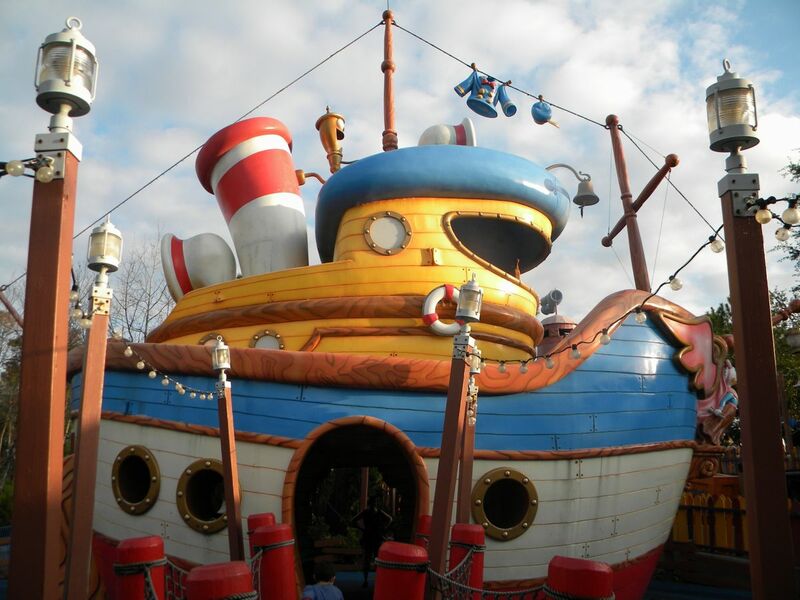 Proof that a serious roller coaster can have a place in the Disney theme parks. Photo by J. Jeff Kober. August: The Disney Wonder is launched by the Disney Cruise Line. September: Tangierine Cafe opens in Morocco in World Showcase. September 14: For the first time in Walt Disney World history, all theme parks are closed early to prepare for Hurricane Floyd. The parks remain closed on September 15, though Disney's Animal Kingdom opened by noon. October 1: Epcot's Millennium Celebration Event premieres with the Millennium Village, offering exhibits from more than 35 countries. "Tapestry of Nations" street festival is held. A giant Mickey Sorcerer arm proclaims the new millennium, and changes are made to Innoventions. Topping all of this off is "Illuminations 2000." Altogether, this would be a 15-month long event. October 1: Journey Into Your Imagination opens at Epcot. November: FastPass is introduced in the theme parks as a way of not having to wait in line for favorite attractions. November: The Skyway attraction permanently closes. November: The Tomorrowland Speedway is renamed Tomorrowland Indy Speedway. Disney's Animal Kingdom offers guests a view of "Sue," an enormous Tyrannosaurus Rex on loan and being reassembled from Chicago's Field Museum. Summary: Walt Disney World opens 2000 high in anticipation of the effects of Y2K. With nothing coming of it, it begins to wind down the long Disney Decade. By the end of the year, the economy begins to soften—again. May 8: Walt Disney World hosts the Global Children's Summit for The Millennium Dreamers for three days. More than 2,000 students from the world are invited to attend. May: DisneyQuest opens a new hi-tech, virtual reality adventure based on the classic, Pirates of the Caribbean. June: Indiana Jones Epic Stunt Spectacular! reopens after a six month refurbishment. Six-hundred special guests named Jones attended. July: Sea World's Discovery Cove opens. December: Disney Vacation Club opens the Villas at Wilderness Lodge, adjacent to Disney's Wilderness Lodge. December: Agrabah Bazaar in the Magic Kingdom opens. 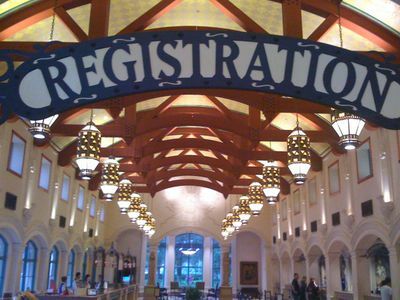 Date Uncertain: Disney's Dixie Landings Resort merges into Disney's Port Orleans Resort. As the fourth decade begins, we find that the attention is not on Walt Disney World, but across the country at Disneyland, where Disney's California Adventure is about to open its gates. But that's the next article. Meanwhile, what was your favorite part of the Disney Decade? Share your favorite memory as we celebrate 40 years of Walt Disney World. Jeff, what a wonderful series this has been. Thank you for creating it. Great article, I love everything Walt Disney World. Over the years I read a lot of negative article about Eisner, but after reading this, I realize he did more good than bad. He took WDW and really turned it into a wolrd class vacation center, has intended from the start. Maybe he stayed too long, but still, I now respect the man. This is a great series of articles. I love reading time lines on WDW, Disneyland or anything else that Disney is involved in. First, let me say that I'm very much enjoying this series of articles. It certainly stirs a lot of memories! "August: Celebration's school opens for it's first year of students." One thing which sticks out to me is how much of the World's "Landscape" is now 15-20 years old. Ellen's Energy adventure is now 15 years old (and how relevant to a kid are Ellen Degeneres and Bill Nye anymore?) Honey I Shrunk the audience is 17 years old, with the last portion of the "Shrunk" ended in 2000, so it's now 11 years out of date. Walt Disney described Disney land as never being finished and I think the imagineers and management have done a good job of changing the parks to keep them fresh. But these two are some examples of how pop culture is used in the parks, except is now out of date and no longer relevant. In order to keep connecting with kids (as well as us adults who pay for admission, Disney Management should look at staying on top of pop culture and refreshing some of the more out of date shows in the near future. I am really enjoying these articles - keep 'em coming! Then Disneyland? And after that, can you put it all together in a coffee table book for me? This is EXACTLY the kind of thing I'd like to see in a book - history with some cool photos thrown in; don't know if there is a book out there that already covers it? But your articles (maybe expanded a little) would be wonderful - again, need the same for Disneyland. And please, if there's one out there already, let me know and I'll try to buy a copy. I'm getting the second 'Imagineered' book for my birthday in two months...briefly looked through it on our trip and it will satisfy me a bit (I hope!) but I really am enjoying your series! The Disneyland Encyclopedia by Chris Strodder ( 2008 Santa Monica Press) may be what you're looking for. There aren't a lot of pictures but as a history of every land, attraction, restaurant, shop and event in DL (with great maps showing you where everything is/was), this book is fantastic. I wish Mr Strodder would do the same for WDW! I'm a few days late in getting to your article, Jeff, so I hope you see this correction. The Mike Fink Keel Boats did not close at WDW in 1997. That date is widely quoted on the Web, but it's actually the closure date for the attraction at Disneyland. 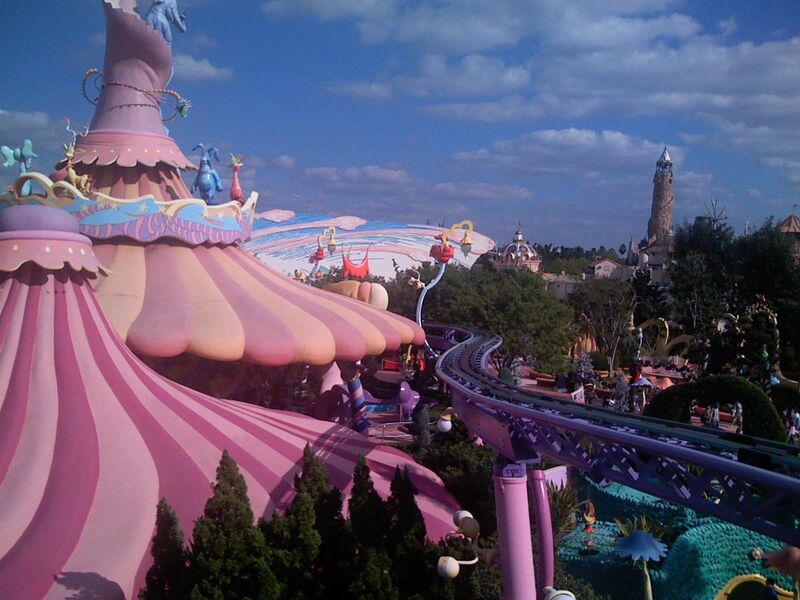 The WDW version was around (though operating seasonally) until April 2001. For more info, see Werner Weiss' excellent Yesterland article about the Keel Boats. Thanks for all the work you've put in to these timelines. They'll be an excellent resource for years to come! Thanks for all who have added their comments--especially those who have provided some needed corrections. In time I would love a more complete outline, that might showcase restaurants and retail even more. Still, there's sure a lot to cover! Thanks!